Located in Downtown Bellevue, directly across the street from Nordstrom. Jackie was born and raised in the Renton highlands. She moved to Colorado when her fiancée left the Navy. 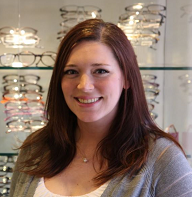 Jackie began her optical career in 2011 at a private practice in Boulder, Colorado, and has been with Envision since 2012. What Jackie likes most about her work is assisting the doctors, administering diagnostic tests, and helping patients find “the” frame. She is also interested in the medical side of Optometry, learning about eye diseases and why they happen, how they are treated and corrected. Jackie is certified with the American Board of Opticianry and plans to continue her growth and education in the profession. will reopen on Tuesday, April 23rd at 10:00am.